I Train to be a destroyer. One Arm Rows like here i do for the perfect Necksnap. Look at my Mighty Body. Strong and Superior! Natural Female Muscles! Anna Konda Female Muscle Legs Hometraining! 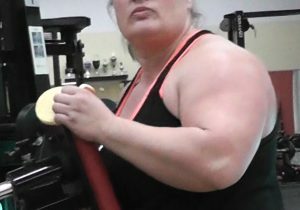 Watch my mighty Natural Female Muscles at work in my CLIPS HERE! ← Mixed Wrestling! I can crush men easily…..